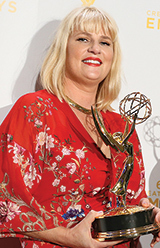 Marie Schley, UVM Class of 1994, won a 2015 Emmy Award for her costume design on “Transparent.” Schley and her colleague Nancy Jarzynko were honored for their work on the Amazon Studios comedy-drama that revolves around a transgender character played by actor Jeffrey Tambor, who also won a 2015 Emmy. We caught up with Schley via e-mail. Q. 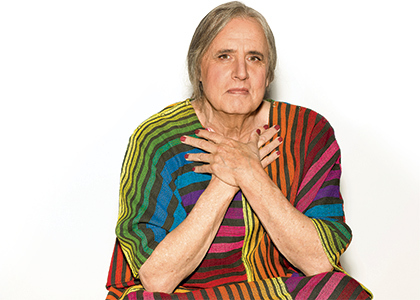 Tell me about the particular challenges or opportunities dressing transgender characters for “Transparent.” What have you tried to achieve in your costuming of Maura Pfefferman? A. Ultimately, I was dressing a fully rounded person, not just someone whose only facet is that they are transgender. Maura is in her late sixties. She has a bad knee. She was a professor who taught at Berkeley in the seventies. She’s from an upper middle class background. She is liberal and well traveled. She has a beautiful mid-century house in the Pacific Palisades. These were all factors that I took into consideration when thinking about what Maura would like and how she would like to present herself to the world. Q. Is it an interactive process working with Jeffrey Tambor on the show? Does he have costumes he prefers, thoughts on ways the character should dress? Marie Schley with her Emmy. Photograph by JB LaCroix/Getty. A.It is definitely an interactive process. Jeffery and I talked about who would have influenced Maura’s style choices. Maura was a young adult in the seventies, and we decided she would have been influenced by some of the women of that time like Stevie Nicks and Mama Cass. But some costume choices were made in a less cerebral way and were more visceral. For instance, during the pilot and in my first fitting with Jeffrey, I tried dangling earrings on him, and he immediately said, “Oh, that’s nice! I don’t know why, but I like the movement.” He began to feel Maura come alive. After that we tried some flowing pants and a top. The sensuality and comfort made him feel like Maura. It made sense because of where Maura was in her life and in her transition to a woman. Q. Congratulations on the Emmy. What does that achievement mean to you? A. Of course it’s amazing and wonderful to win the Emmy, but especially for this show, which has so much heart and love and passion at its core. The show has a profound message for the world about authenticity and acceptance of one’s true self. I am honored to have been a part of that message.